Few US national parks are as remote as Big Bend - the two main northern entrances are both over an hour's drive from any mainstream town, and the nearest major city is El Paso, 300 miles west. Yet despite the isolation, visitation has been steadily increasing in recent years as more people learn about the fantastic mixture of desert, mountain and river canyon scenery within and around the park. 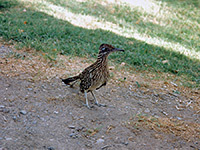 The dominant feature of Big Bend National Park is the Rio Grande, the course of which runs generally northwest from the Gulf of Mexico but takes a long diversion south of several mountain ranges before turning back north towards New Mexico; the national park sits in the lower part of this 'big bend', adjacent to the international border. 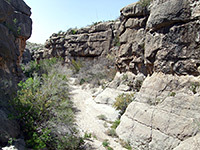 Three major canyons fall within the park boundary; Santa Elena, Marsical and Boquillas, between which the river flows through desert land that is wild and largely unreachable. 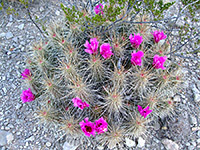 North of the Rio Grande the park is mostly arid and rocky with only limited access by paved roads, a part of the great Chihuahuan Desert that extends across much of north Mexico into the southwest corner of Texas. 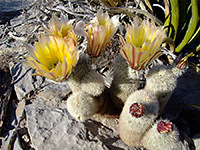 Plant life is particularly varied and plentiful, with over 60 species of cacti plus many other spiky plants. Landscape features include narrow canyons, colorful badlands, eroded rock formations, sand dunes, desert plains, dry washes and oases. Two major roads cross the desert areas of the park, one heading southwest, the other southeast. One prominent exception to the arid desert, and for some people the main reason to visit the national park, are the Chisos Mountains, a huge, angular range of cliffs and rocky peaks rising to 7,825 feet. In these tree-covered slopes the hot desert lowlands are far away and many trails give access to a cool, sheltered world, inhabitants of which include black bears and mountain lions. 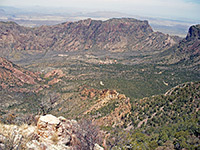 Facilities are concentrated in Chisos Basin, sheltered on all sides by high cliffs, and include a lodge, restaurant, gift shop and campground. 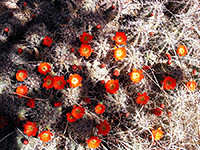 Hotels in the Big Bend region are few and far between. Small places like Presidio and Lajitas have a few motels, but better standard chain hotels are found only in towns much further away: Alpine (98 miles), Fort Stockton (125 miles), Pecos (177 miles) and Van Horn (198 miles) - distances are to Panther Junction.